When we renovated our kitchen in late 2011, we knew that we wanted to get a new kitchen table. But we had no idea what we wanted, other than to ditch the current table that is almost older than my husband. We ditched the chairs during the remodel (falling apart, old vinyl) and ended up just getting a few unfinished chairs from IKEA until we could find something better. I stained those to match the cabinets back then. A few months later, we found what we were looking for. This is the Portland Corner Bench from Whittier Wood Furniture: their site shows the Trestle Bench and Table, too. I cannot remember what website we got this from but they dealt with primarily unfinished furniture. I knew that it would be a little bit of work since it would need to be sanded and stained. When it got here, in 3 boxes, I knew that it was going to take a little time to get it all done. In total, there were 32 pieces. Yes, 32. I could have had a wood working place do it for me... for 400+ bucks. No thanks. Stain is cheap and I am not afraid to get dirty. I was going to start it once it got here but then it got cold. And since I needed to be able to sand every piece, stain it, then sand, then poly it, then sand again and apply more poly, I knew it had to be an outside kind of job. I think I started on it in April (2012). Since Spring was already in full swing due to a seriously mild winter and March temps hitting the upper 70's, we pulled the cars outside of the garage to give me the room that I needed. Since it was going to be used in the kitchen and used A LOT, I had to do several coats of poly, sanding between each. We had a kick arse table. With storage in the bench! Almost a year later, I still love my table. Please excuse the photos in this post. I took them back in October, 2010. I wasn't really interested back then in taking crisp, clean photos for a blog. So, yeah. They could be better. 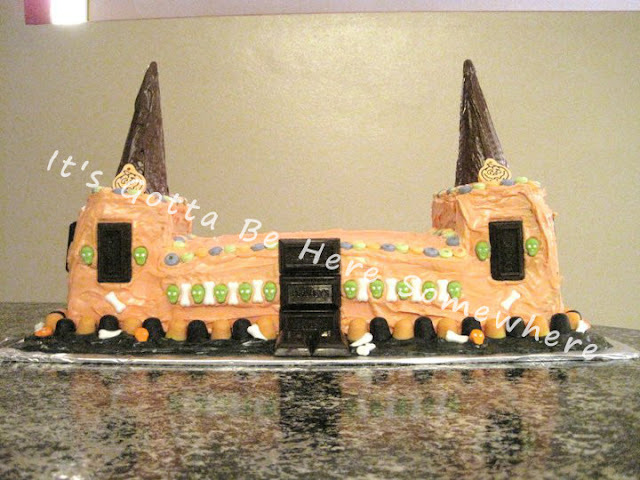 But you should be concentrating on the delicious cake... not the quality of a photo! I found this link to the Enchanted Birthday Castle Cake on Meals.com...somewhere. I cannot for the life of me remember where I first found it. I doubt it was Pinterest. I don't think I was on that site yet. 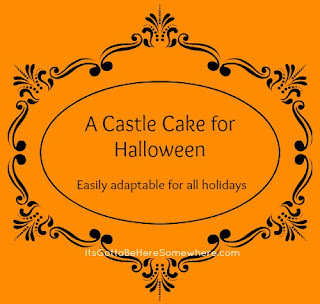 Anyway, I saw it and wanted to make this cake BUT it was October and the next birthday for the kids was in January. Patience is not one of my virtues. It's SUPER easy to make, as long as you own a loaf pan or two. 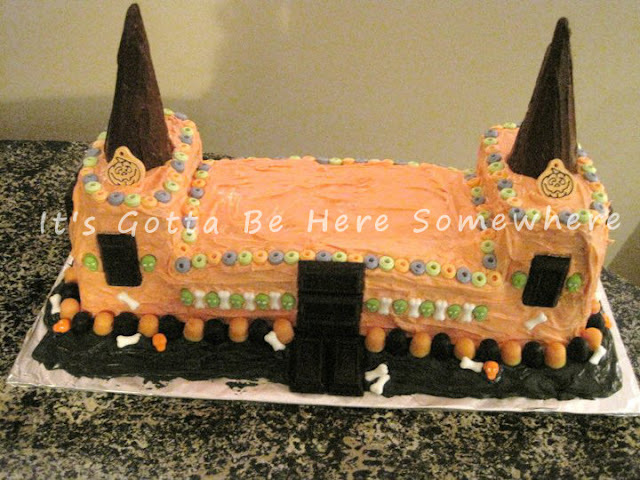 And it's your call what sort of candies you use to decorate it. The things that look like horns are ice cream cones dipped in chocolate. The windows and front door are Hershey Miniatures. And then I just looked around at all of the Halloween candy looking for pumpkins and bones. 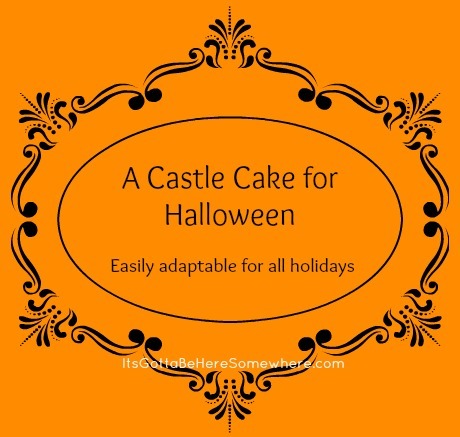 I want to make this cake again this year, for a different holiday. I'm just not sure which one. Ponytails. Our kids rock them most of the year. 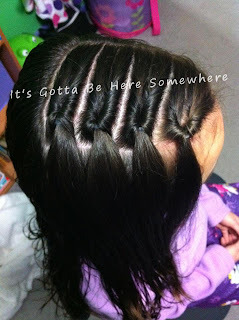 It keep the hair out of their faces and usually involves less tangles. But what about when you feel like they look the same, day after day? I found a website last year, Hairstyles By Mommy, and I have tried a few hairstyles on the girls. We all love them! I loved it because Button could wear her hair down but it would stay out of her face. 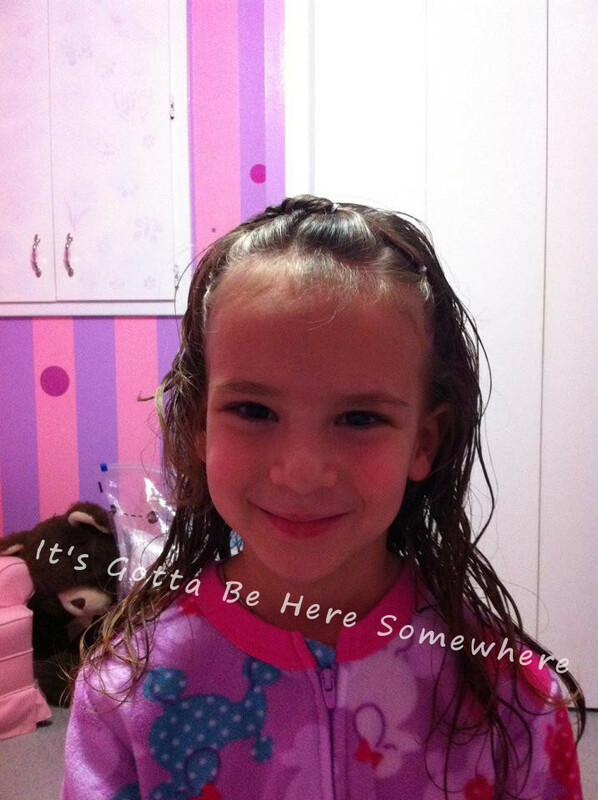 This past fall, she rocked this in her school pics. I loved it. I thought it was neat to use her own hair as a headband. And she loved it. Thought it was SO cool. 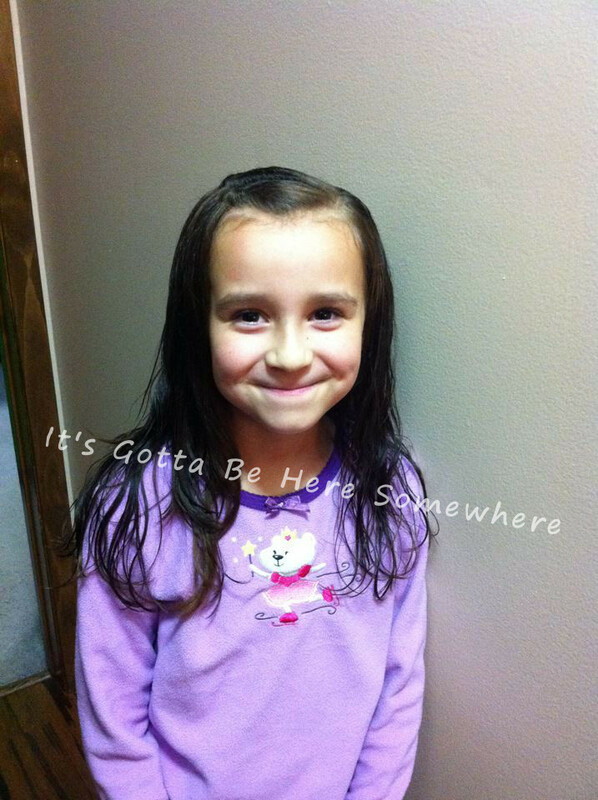 *Yes, in Oct of 2010, when Peanut was only 4, she sat at daycare and cut her hair. Her hair was down that day since she was staying the week with her bio mom (who never pulled up their hair). 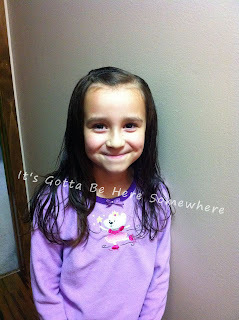 It was bothering her (she hates hair in her face) so she took all of the hair in the front and cut it right off. It was awful. Imagine about 50 different lengths up front, the shortest being not even an eighth of an inch long. 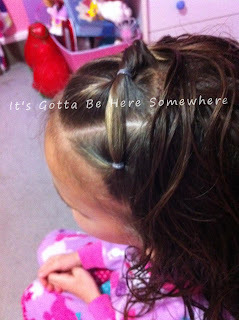 It took eight months to get it long enough to pull it up into pigtails. Spring is actually peeking in on us here in Minnesota and it's bringing out my want need to destroy something. It's very therapeutic. You should try it. No, not something that belongs to someone else. We have done a lot to this house. My mother-in-law owns it and we went it from her. It's a decent size but the four of us have a really hard time fitting into it. A few years ago, we were dying to move out. But then we decided that since it wasn't time to move, it was time to improve. It started with making a loft bed for Button. (Post about that coming soon.) And then somehow, it turned into let's rip up the carpet-let's destroy the kitchen-let's gut the bathroom. And so we did. From start to finish, it took about a month. 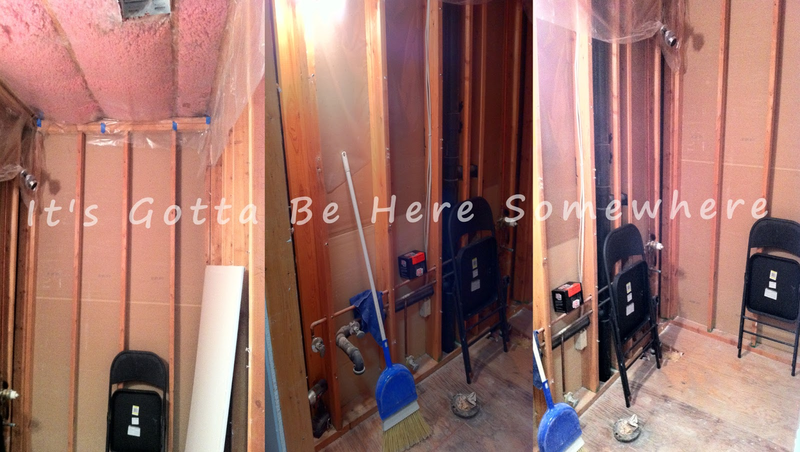 Below are collages I made of the changes that we made to the house back in the fall of 2011. Gross. Looking at these pics again makes me wonder why it took us a few years to rip that nasty mess up and toss it. ~As you can see in the first pic on the left, there was a little wear and tear. ~Then you see where there was water damage to the carpet pad.... AND how it seeped into the sub-floor. And then we had to remove the entire sub-floor as well due to the people that built this place used nails, not screws. Talk about SQUEAKING. It was horrid. I went to town on that carpet with box cutters. Seriously, I felt a little maniacal and got slightly worried. But I got over it. ~First pic: New sub-floor and then a vapor barrier. ~ Hey, there's my hard working husband installing our gorgeous new floor. ~ All done! (It's not the orange in real life. My camera was being a turd and the lighting in the room back then was severely lacking.) And yes, that appears to be the original Parent Trap on TV. That green paint seemed like a good idea in the beginning. But within a week, we hated it. 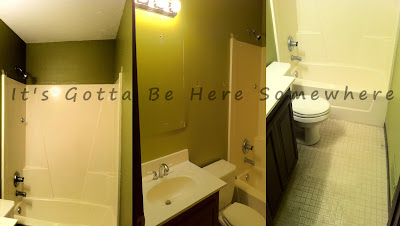 Before this gutting of the bathroom, we had already replaced the 20+ year old bathroom tile and painted the walls that nasty green. Gross. Yup. The only way to go... all the way (down to the studs.) Tearing those walls out was a great way to relieve frustration and it was exercise. ~ First pic: That tub is SO much better than the old one. It's deeper so ADULTS can actually get into a bath and have the water cover more than just your back half. ~ Second pic: We found the medicine cabinet at IKEA. My husband recessed it into the wall slightly so that it didn't stick out so far. The little boxes next to are supposed to be the other direction but this way, the shelves became boxes. Instant storage shelves. ~ Third pic: My husband and I tiled the entire shower and the floor. We are so happy with it. ~ Fourth pic: I found the vanity at Home Depot...slashed down over 100 bucks. I think we paid less than 40? I sanded it down and stained it to go with the rest of the house. ~ And the shower curtain I found at Targer just really went with the colors we chose. I used to hate the kitchen. It is fairly large but the design layout left me with very little counter top space and storage. The space wasn't utilized correctly. I documented the kitchen more than the other rooms. I think by then I was actually remembering to get the camera out. ~ First pic: The cabinets were painted this DEEP chocolate brown. Seemed like a good idea at the time. But it was WAY too dark. ~ Third pic: Why, yes. The people that built this kitchen STAINED THE WALLS behind the lower cabinets. We still haven't gotten over that. ~ Last pic: The cabinets are so dark here due to the lighting in the room when I took the pic. ~First pic: Those corner cabinets were a NIGHTMARE. They were not helpful, being those 4 foot long blind cabinets that you have to crawl into to find anything. ~ Third pic: Oh, look. More stain on the walls. ~ Fourth pic: It's getting there! ~ Last pic: Oh yeah. That's why the lighting was off. I had the cabinet lights on, not the overhead lights. We put lights on top of the cabinets, in 4 of the cabinets, and under the cabinets. I love, love, love all of the different lighting, all controlled by independent switches. And the corner cabinets on the bottom are now Lazy Susan style which makes my cooking life SO much easier. ~ Firs pic: See what I mean about not using the entire space? The cabinets and counters just STOPPED at the fridge but there was still space to work with on that other wall. ~ Second pic: That stain on the wall is killing me. ~ Third pic: Oh, WOW! PANTRY SPACE. The lower cabinet has a Lazy Susan and it makes storing cans and whatnot so much easier. And I got myself more counter space! And a nook for the recycling! It's a win-win-win! The ONLY problem that we had throughout the entire thing was the counter tops. We went to Home Depot and picked quartz for it's beauty and durability. The company had grades A-E, A being the cheapest. We knew we could afford the B range so we picked out what we liked and headed over to schedule the measuring and install. Then we picked out the backspalsh to match. My husband talked to some lady at the company. She was not happy with our service and wanted to make it right. She asked if any other rooms needed counters. No. So she offered to let us upgrade the type of quartz, for free. We were weary about asking... how much of an upgrade? Uh, how about letter E!!! Yes, we got to go back and pick out a color of quartz from the highest price point they offered. We were ecstatic! And since the new didn't match the backsplash, we had to return it and get something else, which turned out better and a dollar cheaper per square! Then the guys came to install it and again, the measuring guy screwed up. He had marked us as having an undermount sink on the form but put in the order for a DROP IN. We were livid. The guys installed the rest of the counters and then had to take the longest piece (and our sink) back to the shop to fix it. But the lady we had already talked to called and set it all right. They manufactured a new piece THAT NIGHT and gave us a free gift (see pic below). And our free gift: A matching cutting block. Sometimes, even slip-ups can result in wonderful fixes. We got hooked up for that guy screwing up. Next renovation project: Destroy the back deck before it comes crashing down, killing us all. Okay, so I have some obsessions. I get obsessed with things that make my life easier/better. Seriously. The best travel coffee mug ever. (And I've tried a lot. I've Googled a lot.) This thing is making my life so much better. It keeps coffee HOT, not warm, for hours! Yes. Even when the mug is sitting out in 50 degree weather in the garage three hours later, it's still hot. Still trying to get used to that. With my old mug, 3 hours later the coffee was lukewarm, at best. I could take a swig and it was okay. With this one? You forget and take a big swig and scald the back of your throat. ~ It's cool to the touch no matter how hot the coffee or tea is inside. Love that. ~ It is leak proof. As in, once I closed the lid I shook the hell out of it upside down and not a DROP came out. Woot! Perfect for mixing your sugar/creamer/whatever up after it sits a little while. ~ The lid comes apart...into 4 pieces! YAY! No more hard to clean lids that get that nasty, gunky coffee build up over time. LOVE that. The only downfall anyone talks about is that the finish can peel off over time. (Yeah, keep dropping it from a moving car, letting your kid used it as a toy, and shove it into a backpack on a commute and see what finish wouldn't peel off.) If that's the WORST thing about this mug, that's totally fine. I don't really care what it looks like. I care that it keeps my happy juice HOT. 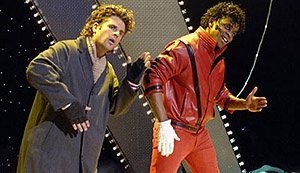 Yes, that's Shawn and Gus as part of Tears for Fears and Michael Jackson. You can watch the performance here. This was the "America Duos" episode (an homage to American Idol). The show is so well written, the cast is wonderful (they ad lib a lot), and the guest stars have been fantastic. Tim Curry, Judd Nelson, Ally Sheedy, Molly Ringwald, Cheech Marin, Carey Elwes, Wayne Brady, James Brolin, Louis Gossett Jr., Danny Glover, C, Thomas Howell, Ed Lover, Jane Lynch, Ralph Macchio, Malcom McDowell, Robert Patrick, Jaleel White, Mekhi Phifer, Lou Diamond Phillips, Jason Priestly, Freddie Prinze Jr., Rachel Leigh Cook, Jonathon Silverman, George Takei, William Shatner, Curt Smith (Tears for Fears)... the list goes on and on and on. And yes, that is 3 members of The Breakfast Club with Anthony Micheal Hall appearing this season. Now they just need Emilio and we're good. And tomorrow night? The homage to CLUE! Guest starring Lesley Ann Warren (Miss Scarlet), Martin Mull (Colonel Mustard), and Christopher Lloyd (Prof. Plum). Too bad Tim Curry played Nigel St. Nigel in "American Duos". He would be great in this episode. And for the "100 Clues" episode, the fans get to vote for the ending. I love this show due to their interactions with fans. In February, they had a Psych Slumber Party on USA. It started at midnight EST and ran until 6 am. It was 7 episodes, very little commercials, and Twitter was blowing UP for about 24 hours. James Roday (Shawn on the show) is a huge Twin Peaks fan so they let him do the "Dual Spires" episode as an homage. And WOW the amount of Twin Peaks stars that were in that episode: Dana Ashbrook, Robyn Lively, Sherilyn Fenn, Lenny von Dohlen, Ray Wise, Sheryl Lee, even Catherine E. Couslon (aka, The Log Lady). It was brilliantly done. I even have a board on Pinterest dedicated to the show. And me being an 80's fan, there are SO many references in the show that make me laugh hysterically. It's USA Networks longest running show to date. We know they get at least one more, season 8. Here's hoping they get to 9! 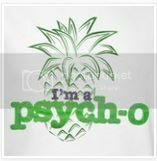 Sorry, I think I went off on a Psych tangent. That happens! My body is going to do WHAT?! Button is almost 10 years old. 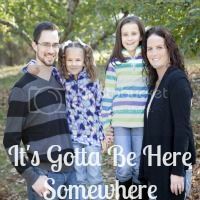 My husband and I have discussed the timing of when we I would tell her about the hell her body will go through in a few years and continue to go through throughout her life. Yeah, I may not be the best one to tell her. HA. For reference, she knows very little. When the kids still saw their bio mom, she told them that they had vaginas. Yes, she used the word. Yes, Peanut was only about 4 at the time. And no, she didn't tell them exactly where it was or that boys have something different. That was lots of fun clearing up. She ran screaming from the garage. I laughed hysterically. I couldn't help it. It was funny. And no, that's not the end of the conversation. And yes, she's fine. She's not scarred. Yet. This should be interesting. I cannot wait until we pick her up on Friday. Warning: Long post ahead. But when has history ever been brief? As a kid, I wasn't fat. I was bigger than the other girls in my class, sure, but it wasn't just weight. I was a head or two taller than everyone in my grade and the grade above me until around 6th grade. I stuck out in more ways than one. My "under-eating" started in the summer of 1994 when I went away to tennis camp. You can read about that here. But when I went off to college, I didn't gain that "Freshman 15". I lost 15 pounds due to not eating enough and constantly being out and on the go. By the time I was in my early 20's, I weighed anywhere between 130-135. But I was "flabby thin". I didn't workout. I was just ALWAYS out. And my diet was terrible. For the most part, I subsisted on Taco Bell, Sonic, and McDonald's. I would have looked healthier if I was more trim and toned. I wore a size 29/size 6 jeans for years. I wore tank tops as a uniform and some of them showed a little belly. But then all of that changed when I moved to MN. For the first few years, my husband and I were really inactive. And we had the "nummie box". Before I moved here, I sent a small UHAUL box to my husband and the kids for Valentine's Day. It was filled with candy and a stuffed pig that sang. The box weighed 21 pounds. And we still have it. (It was even featured at our wedding. Our baker made a grooms cake in its likeness. I will post pics of this soon.) It's still full of candy, not the same candy, and we SOMETIMES eat from it. I find that I don't want to eat as much candy anymore. We sat on the couch, watched our shows, and ate candy. And I don't even want to think of the amount of fast food we ate back then. But even then, I wasn't eating enough after awhile. There were days were I ate once. Once. Just one meal. And it was usually in the evening and it was always fast food. See, if you start eating less food, for a little while, your body will start to feed on stored fat and you'll lose weight. But when you don't eat enough for long periods of time, your body goes into "storage mode" and you start to gain weight...quickly. That's what happened to me. I wasn't eating enough and I NEVER worked out and all of a sudden, those size 29's didn't fit. And then the 30's didn't fit, followed by the 31's. When I finally hit the size 32's, I knew I had to do something about it. Christmas-2010: I was getting in the shower and looked into the mirror after I got undressed. I was astounded, disgusted, and furious with myself. I had never been that big before. My mother asked me when I called her crying, "how could you not have seen it before then"? To which I replied, "Mom, women don't typically like to look at themselves naked. Men like to look at naked women". I knew I couldn't keep doing the same old thing and see any positive changes. We were out of town for a week after that and it then that I decided to buy an elliptical machine and use it. In January 2011, I started working out and counting calories to make sure that I ate enough. I worked out for a week before weighing myself the first time so I figure I lost a pound or two more than what I tell people. On January 16, 2011, I weighed 182.4 pounds. By June 2011, I weight 160 pounds. I was SO happy. We left for vacation and I was almost into the 150's, finally. And then it all fell apart. We were gone a lot that summer and when traveling, I lose the will and determination to workout. By August that year, I was still around 160 but I wasn't working out. 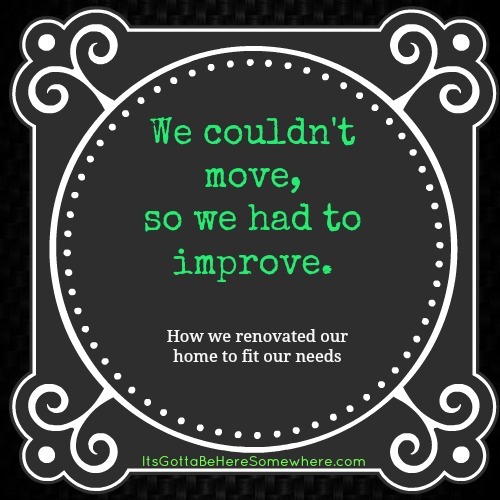 And then we started renovating our house. Oy. Who needs a workout when you are ripping up carpet and subfloor, ripping out a bathroom, destroying a kitchen, and spending up to 12 hours a day doing construction? It took us a few weeks to get it all done and when it was over, we were exhausted. The kids went back to school and we did nothing. And I mean nothing. I think we slept for a few days and then vegged on the couch for a week. And I never got back into working out. Fast forward to this past Christmas, 2013. Here we go again. ALL of the weight I shed managed to find me, after I thought for sure I had lost it. So, on January 16 of this year, 2 years after the initial weight loss, I began to head down to the basement and workout. This time, it WILL stick. I hope. I only had free weights the first time back in 2011. This time, I invested in a weight machine and it's been worth every penny. My arms are already gaining SO much muscle. And since I was getting beyond bored with the elliptical (cardio is not even close to being something I enjoy) I purchased a rowing machine. I love that thing. It's been 2 months and I am down a little over 10 pounds. The scale says that not only have I been losing weight, I have been gaining muscle. Our scale also shows your BMI, bone mass, and water levels. I can happily say that the BMI is going down while the water and bone levels are going up. So now you know how I got here, wandering down the Rocky Road to Healthy again. What about you? Have you ever struggled with your weight? Have you ever plunged into an exercise program? Tell me about it. So many people trying to lose weight in this country are talking about not overeating. I read blogs where dieters are constantly looking for ways to curb their appetites or not sit on the couch and constantly eat. That's never been my problem. It's not intentional. I have never had an eating disorder. There are just times that I forget to eat. I had a healthy appetite when I was younger. I could put away 4-5 pieces of pizza at Godfathers and go for some dessert pizza afterwards. But during the summer of 1994, that changed. In 1994, I went to a tennis camp in Florida for a month. They fed us chicken (cooked any way you can imagine) and lots of pasta. We needed the energy. A typical day found us playing tennis from 8:30-noon, then lunch and a break (we used the break to change clothes, and then we played from 1ish-4. Plus, it was Florida in the dead of summer. HOT and HUMID. When I returned home, though, my mother was worried about my eating habits. Instead of 4-5 pieces of pizza, I ate 2. My stomach shrunk from eating right and working out. The doctor told her that it was normal and I was actually eating more of what I should be eating. But over time, I lost track of what I should be eating a day. To be honest, no one ever told me that. I was never told to eat a certain amount a day. Most of what you have always heard on TV and in magazines is about eating LESS, not more. I guess I may be in the minority with this under-eating problem. I have to use the Spark People website and App on my phone to track my food. If I don't, I don't eat enough. And when you are working out, especially building muscle, you need fuel/food. It really is a great tool for tracking calories, fat, carbs, and protein. It will also keep track of vitamins like Vitamin C as long as you always input the correct info into the trackers. I should be eating anywhere from 1560-1910 calories a day, since I do cardio and weights up to six days a week. And to some, that may seem like nothing. But I have a HECK of a time trying to get over 1500. My stomach just doesn't want that much food normally. But I am trying very hard to train my body to want this much food. I think I might write up a post about the uses of Spark People sometime soon. Now, if you'll excuse me, I think I need to eat. Yes, I am in my early 30's. Yes, I know that Pretty Little Liars on ABC Family is a show designed for teens. Yes, I know that some people are rolling their eyes at me for loving this show. So what? It's my TV and I'll watch what I want to. I was hooked. And then I got my husband hooked along with me. Because here's the thing: That show is NOT just for teens. Some of the things that they deal with are far more mature than most teens that I know. As the writers like to say, it's Hitchcock for teens. You see those ages, right? Females, 12-34? Women, 18-34? Women, 18-49? I found out online that the show was developed based off a series of books by Sara Shepard. So, being an avid reader, I loaded them onto my Kindle and away I went reading about the girls. In the beginning, there were only 8 books and I knew that I could read them before the second half of the season aired in January 2011. But my thoughts on those books are for a different day, a different post. The TV series was developed by I. Marlene King and I have to say, I am enjoying HER version of events much more than the books. Following Marlene on Twitter is amusing. She posts clues, or misdirects, when she can or wants to. I admire her as a writer and a person from what I have seen her say and Tweet. And after each episode, I read the weekly recaps by Heather Hogan at AfterEllen.com and Jacob Clifton at Television Without Pity. Warning: You CANNOT just read their recaps and understand the show. They usually put their own spin on the dialogue and events which in my opinion, makes them funny as heck. If you only read those recaps, you're only learning about 3% of what the show is actually about. But since this a mystery show, there are tons of questions that pop up each week, each season, and when some of the questions don't get answered quickly (or at all), it leaves me feeling wounded. I like answers. I don't expect them RIGHT NOW but over time, you have to have them. I was a HUGE fan of Heroes on NBC when it first aired. I made it through the first few seasons and then I couldn't take the unanswered questions or the GIANT loophole in the writing. (In the future, Peter WOULDN'T HAVE A SCAR. He saved the cheerleader and was impervious to wounds just like Claire.) The biggest writing blunder really angered a lot of us fans. I posted with some great people on a Heroes Forum on Myspace and we were ALL so angry at the oversight by the 11+ writers on that show. And since so many other questions went unanswered, I couldn't handle watching it anymore. I pray that this doesn't happen with PLL. I truly enjoy the show and don't want to lose my interest due to questions from season 1 NOT being answered by the end of season 3, which aired this past Tuesday, March 19. In the season 3 finale, I felt let down. I was only shocked by one moment and was then weighted down with even more questions. I am doing this part of the post for myself, more than anything. Here, I will keep a running list of the most important questions that I want an answer to sometime soon. If they get answered, I will update the post to show this has happened. ~Where in the heck does A get all of this money? The gadgets, cars, airline ticket to CA, money for booze (to drink or put all over Jason's front porch)? ~Which brings me to, A must be over the age of 21 with the amount of alcohol he/she imbibes legally in airports and liquor stores. Right? Veronica Mars Movie- Let's make it happen! I woke up to EXCITING news. I am a HUGE fan of the TV show, Veronica Mars. Seriously, one of the best shows ever. The cast was great, the writing was great, and it's such a quotable show. And how adorable is Kristin Bell? Did you ever see her on Ellen? The video Dax shot of her and the sloth? Loved it. Fans of the TV show have been fuming for years that the WB canceled the show. WB was doing a lot of that back then. And since then, we fans (Marshmallows) have been eagerly awaiting a Veronica Mars movie. After YEARS of waiting, it may be happening!! But the fans MUST rally and support it. IF Rob Thomas can come up with 2 million dollars to make the movie, WB will put the movie into production and pay for the marketing, promotion, and distribution. YAY! Yes, it's a lot of money. But in just the last 4 hours since it was announced, they have already raised $860,209. WHOA! They have 30 days to hit 2 million. If they go over 2 million, that's even better. ALL of the money raised goes towards the movie (location, editing, special effects, etc). So the more money, the better. At this rate, I see the goal being hit within a day or two! There are so many Marshmallows out there willing to do what they can to make this happen. To donate, simply go to the Kickstarter Page and give what you can! I am SO excited. I miss the show and the way it went off the air, things were left unsettled. It's time for closure. Update: As of March 30, the project as raised $4,310,177! And there's still 13 days to go!